The other day — Sunday, in fact — my wife came home from service at our church, raving about the sermon from our passionate, activist, youth-orientated co-pastor. 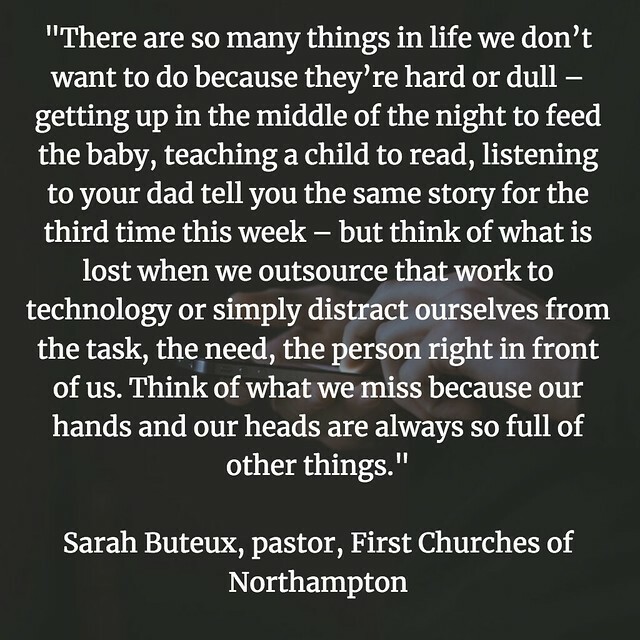 The theme was technology in our lives, and Pastor Sarah, who often uses hip and modern allusions in our sermons, talked about how our devices are removing us from our interactions. My wife later sent me the link to her post/words/sermon later, which includes Sarah’s sermon (if you are interested in listening, you can, but I am by no means proselytizing here). She had a very catchy and provocative title: Is the iPhone the Devil? Reading through what she said connected me nicely with some of the inquiry that has been underway with Networked Narratives, on how technology’s dark side seems to have overtaken its potential and possibilities. Think of what we miss because our hands and our heads are always so full of other things. Most of all, our focus on our devices — on our hands, which are no longer free to be of use to us because they gravitate to our devices, Sarah notes — seems have to removed us from many human interactions, and the impact of that shift is seen in political diatribes, family arguments on Facebook, and the way we fail to ‘read’ the impact of our words on people. Which is not to say that technology is evil. It’s not. But it’s not neutral either. It’s never going to stop trying to help us overcome our limits. Which means it’s up to us to remember that it is our limits that give life meaning. Keeping on eye on our lives, and the people in our lives — our shared humanity — and the role that technology can play to make it better or worse — if we let it, and this is the most important part of this whole discussion, the way we use or take back our agency as users of our phones and computers and technology — is lesson we can learn from, whatever your spiritual centering. This phone creates the illusion that you are infinite, but you are a finite resource. Your love, your time, your attention, you yourself are precious precisely because you are limited. This entry was posted in NetNarr, Slice of Life. Bookmark the permalink. Thanks for writing this Kevin, it subtly foreshadows what we are aiming for the latter part of #netnarr, asking students to create some human level strategies for taking that agency back. The one thing I grapple with is the idea the technology has a will, or an aim, like the Kevin Kelly book title “What technology wants” – doe sit have power? do we give it? I know the research says that technology is designed to have these characteristics, to have us feel like we cannot put it down. I am not comfortable giving technology power like that. And that closing quote is framable. Thanks for stopping by with some tasty kibble … and thoughts, and pondering. I, too, find myself mixed on Kelly’s ideas (I read the book but wasn’t convinced, even if I was intrigued). And the postcard? Gonna do some research on the prairie boat.